Nuts about both traditional and electronic music, and singing in four different languages, this gifted likembe player shares his deep and undying love for his country - Angola - with his audience. 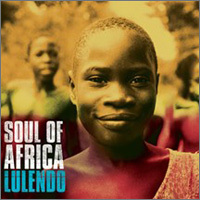 Initially discovered by Yannick Noah and Bebel Gilberto and acclaimed big time after his first tour in Angola playing alongside Manu Dibango, Lulendo's appeal not only lies in the originality and charm of his music but also in the clarity and gentleness of his voice. 'Soul of Africa', his third studio album only just released by Vox Terrae, is a glowing tribute to his ancestors, as well as transmitting a message of wisdom that embraces the future with boundless optimism. This album is a real artistic U turn, a return to origins as well as flicking the spotlight onto his diverse cultural heritage. Compiled in strict collaboration with his friend, guitar player and arranger Claude Samard, and enriched with instruments conceived over the last 2 years such as electro-acoustic likembes and a harp designed and made with the help of stringed-instrument maker Bernard Prunier, 'Soul of Africa' is a delicious treat to be shared amongst friends in the shade provided by masses of bougainvilleas or a pergola of passion flowers - a real summertime must-hear!